We know that Trick or Treating time hasn’t actually come and gone yet but we find that we have leftover candy each year above and beyond what our kids collect on Halloween night, so we like to be prepared with some creative and delicious ideas of what to do with it! Don’t get us wrong; our kids have a sweet tooth and all, but there’s always some leftover candy that ends up sitting around for too long. That’s why we’ve been looking up awesome dessert recipes that will use it up in interesting and even more delicious ways! 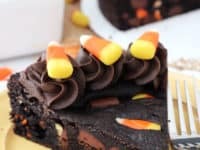 Just in case your find yourself with a bunch of leftover Halloween candy to, check out these 15 awesome and delicious recipes that are made with all kinds of miniature treats. 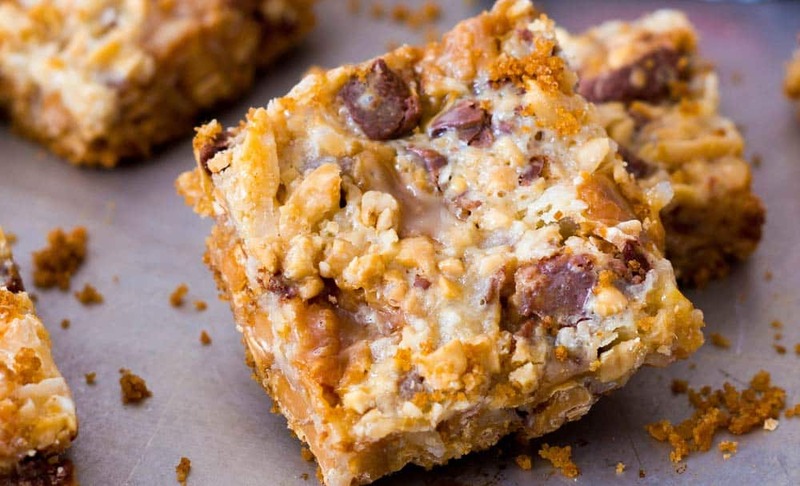 If you’re the kind of treat lover who adores sweet and salty flavours combined in one place, we just might have found the right recipe for you straight out of the gates! 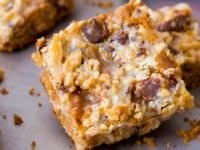 Check out how Half Baked Harvest combined peanut butter cups and popcorn with caramel to make these delicious cookie bars. Have we already totally hooked you on the idea of making something that involves both Halloween candy and cookies, but you’re not so sure about the salted element after all? 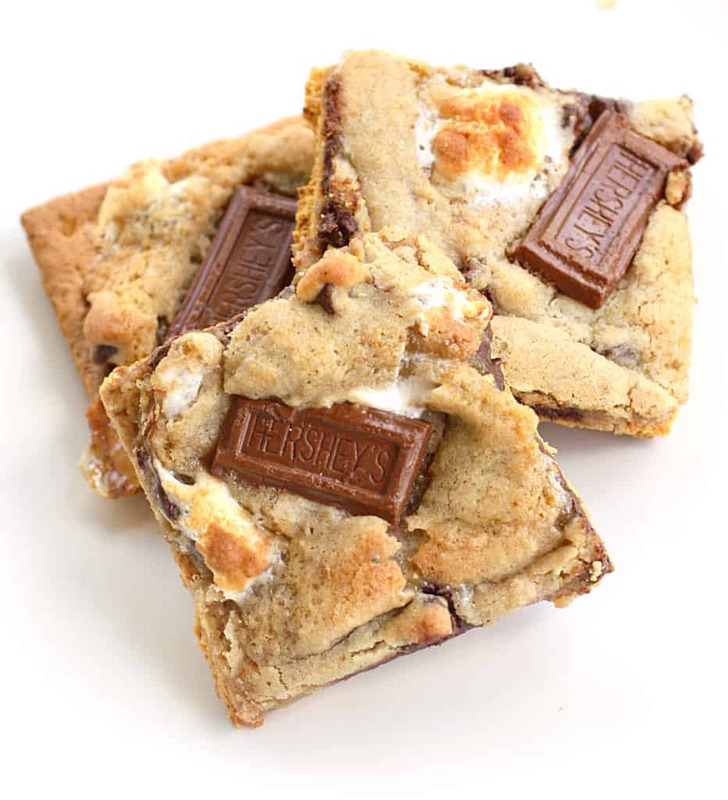 Then we have a feeling you’ll get along a little better with something like these S’more cookies from The Girl Who Ate Everything that are made with mini Halloween chocolate bars! In our house, we can never go wrong with making brownies because they’re a huge family favourite and they’ll always get eaten, no matter what kind we make. 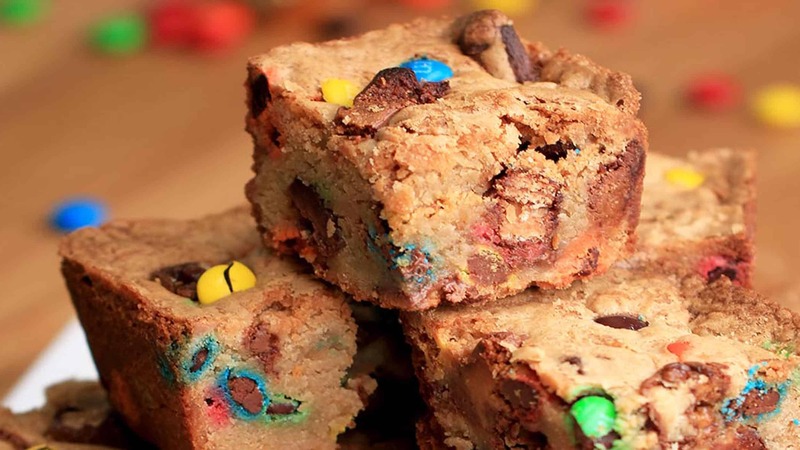 That’s why we loved stumbling across this candy bar brownie recipe from Averie Cooks! 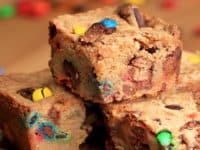 You can use pretty much any kind of spare mini chocolate bar you have, but we particularly adore making them with M&M’s somewhere in the mix. Marshmallows might not be something your kids get in their Trick or Treating process, but Skittles certainly will be and we don’t mind buying an additional ingredient if what we’re making is really worth it! 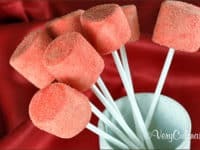 That’s why we couldn’t take to try our hand at this Skittles marshmallow pops recipe from Very Culinary that both looks and tastes totally awesome and unique. 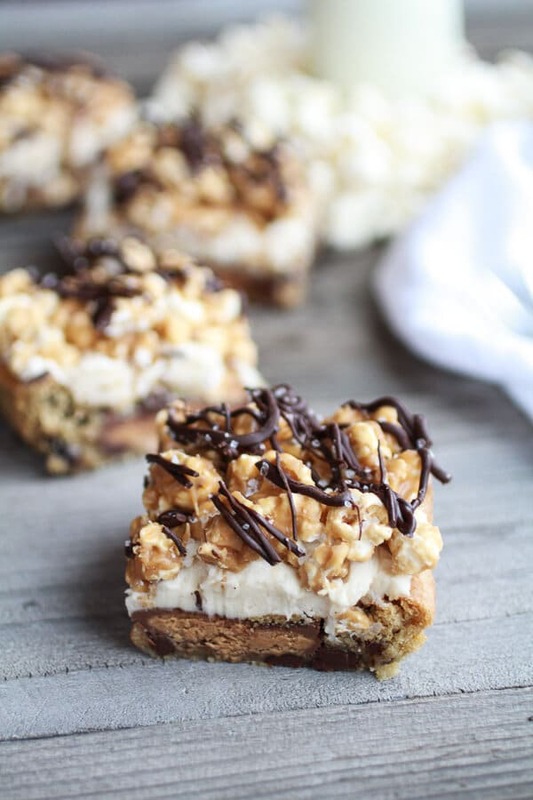 Bark just might be one of our favourite new sweet treat trends to come out of the baking world in the last few years, so we’re sure no one in our lives would be surprised to learn that this idea from Completely Delicious is one of our very favourites on the whole list! 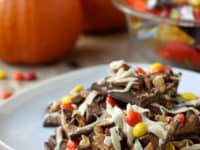 Their tutorial shows you how to make a bark with all kinds of chocolate based leftover Halloween candies for a satisfyingly sweet crunch. 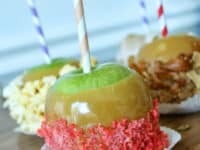 Now, we know that candy apples are a classic treat and really nothing new, but that doesn’t mean you can’t put an exciting new twist on the idea to really get your family excited! 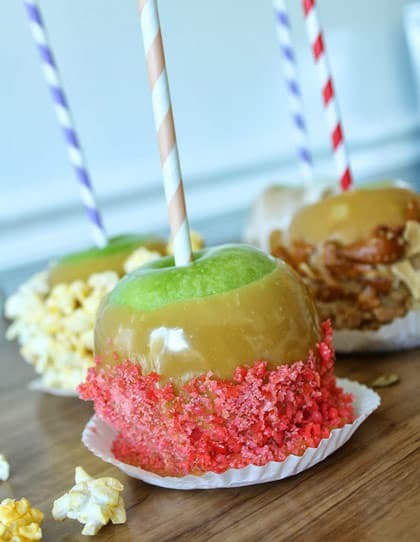 We love the way Lynn and Lou using all kinds of leftover Halloween candy to liven up a caramel apple (but we’re particularly intrigued by the Pop Rocks idea). Perhaps it’s the adults in the house who have really been eyeing up those leftover chocolate bars because the kids have already had their fill and lost interest a little bit? 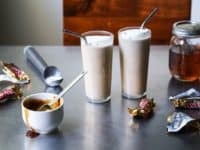 Well, if you’d like something that’s both a sweet treat and a creation that will help you unwind, then we’d definitely suggest taking a look at how Kitchen Konfidence made this fantastic bourbon and Twix bar milkshake that’s blended to perfection in terms of both flavour and texture. Are you the kind of candy lover who adores both chocolate based treats and chewy style candies, but you often have trouble choosing between the two? 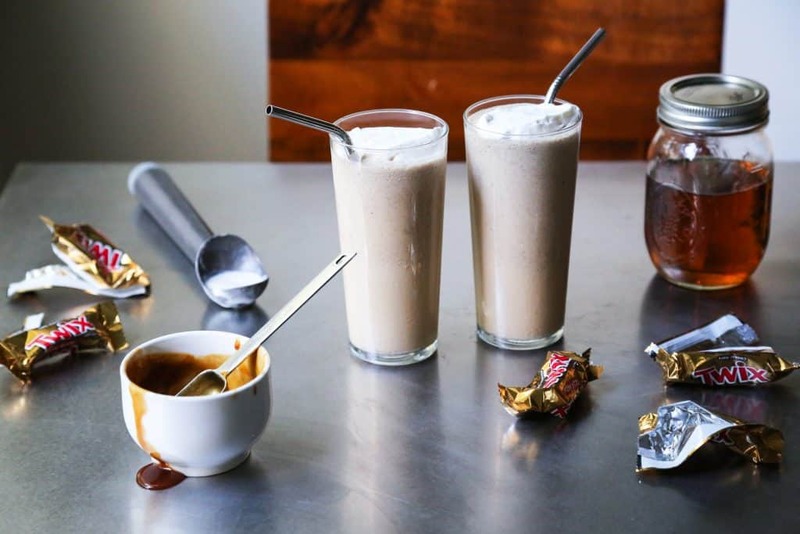 Well, what if we told you that you could make a custom treat that actually involves both of those things? Take a closer look at how these candy corn butter finger bars are made on Nosh On It. Sometimes we find that our very favourite candies in the Trick or Treating bag can be amped up even high in terms of great taste when we take them to the next level rather than just eating them right out of the box. 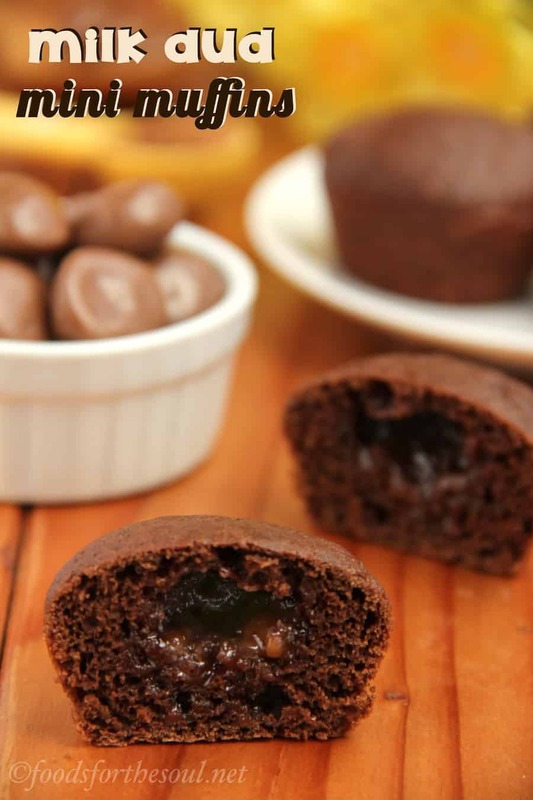 That’s why we were so excited to come upon these milk dud muffins outlined step by step on Amy’s Healthy Baking! Each muffin has a delicious surprise in the centre. 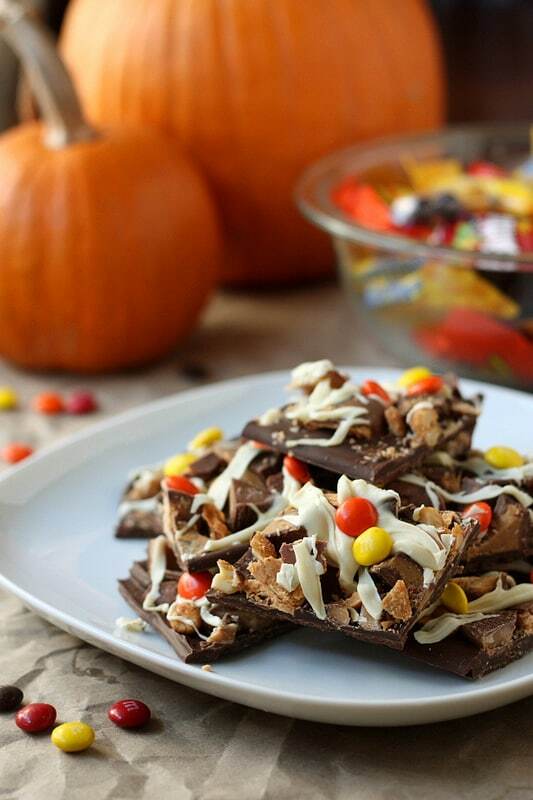 If you’re going to get creative with your leftover Halloween candy, would you rather make something so rich in flavour that it’s almost decadent? 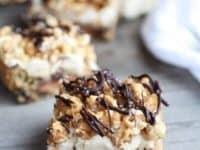 In that case we’d absolutely suggest taking a look at how Nosh On It used Snickers bars, caramel, oatmeal, and other fantastic ingredients to make these ultra satisfying and completely delicious 7-layer bars. 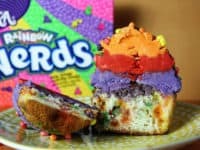 When you started searching for ways to get creative in the kitchen using your leftover Halloween candy, were you actually picturing something a little more colourful and unconventional, rather than just sticking to using the chocolate bars? 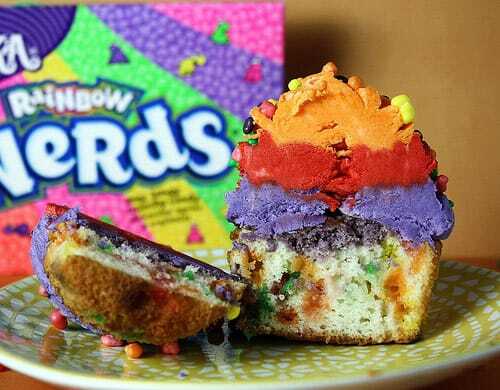 Then we’d suggest digging through the pile for all of the bright, fruity tasting Nerds and taking a look at how Confessions of a Cookbook Queen used them to make these fantastic and unique tasting rainbow cupcakes! 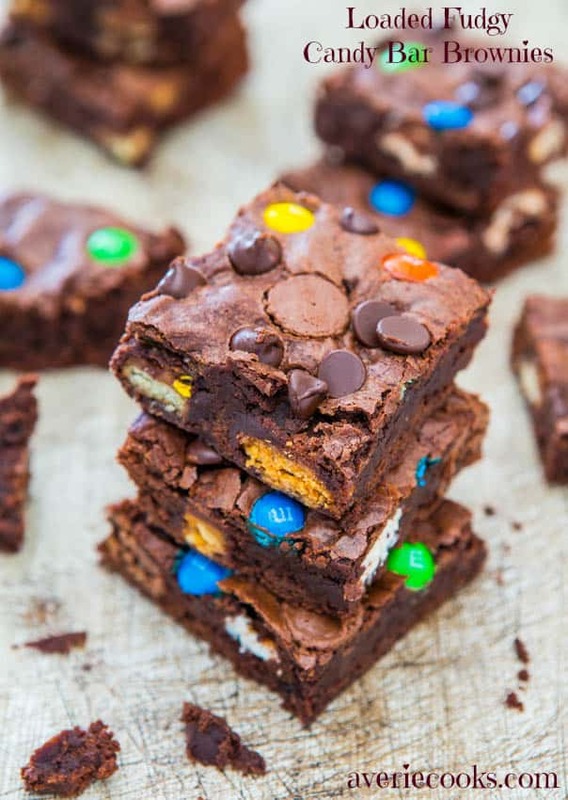 Perhaps sticking to the chocolate bars in your bag is exactly what you want to do, and you were quite enamoured with the idea of making brownies like we showed you earlier, but your favourite kind of brownie has always been layered? 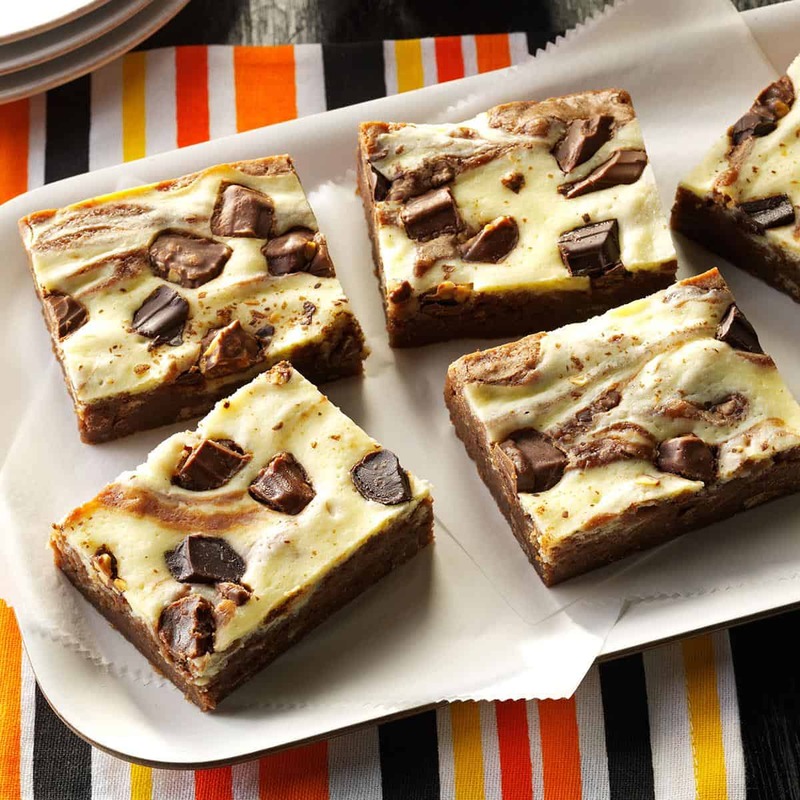 Then we definitely think you should take a look at how Taste of Home made these fantastic candy bar cheesecake brownies in surprisingly few simple steps. Here’s another combination recipe for your consideration, just to keep things interesting! 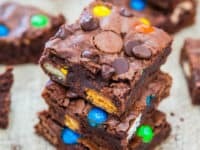 This idea from Today shows you how to get the best of several different worlds by creating bars that taste like cookies, have the density of brownies, and still have all the miniature leftover Halloween candies you love most all mixed in. 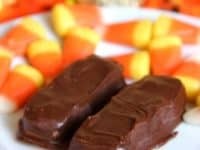 Did we almost hold your attention when we started talking about the idea of combining chocolate and candy corn in one place, but you’d rather make some kind of full dessert rather than just individual bars that your kids might snack on? 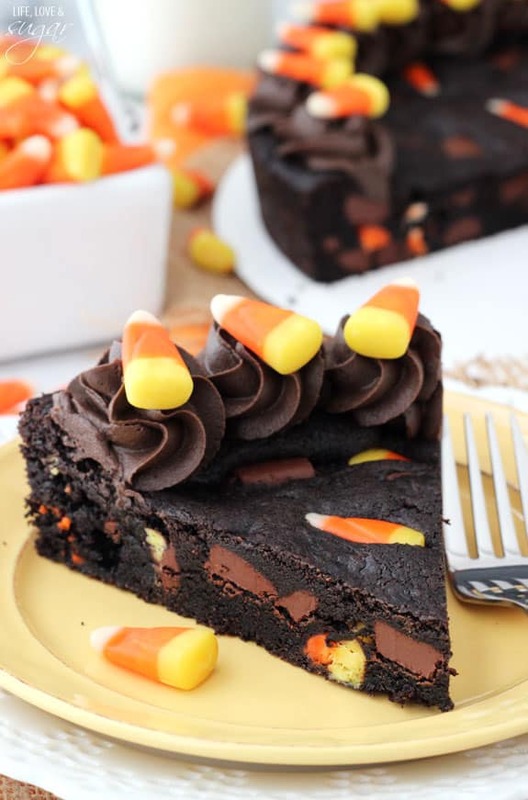 In that case, we think perhaps you’ll get along a little better with something like this sweet, rich, and delicious candy corn chocolate chip cookie cake outlined step by step on Life, Love, and Sugar. 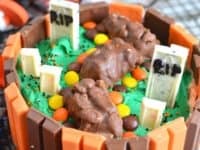 If you’re going to make something super fun and delicious with the leftover Halloween candy in your house, would you rather make it something your kids can actually have fun helping you with? 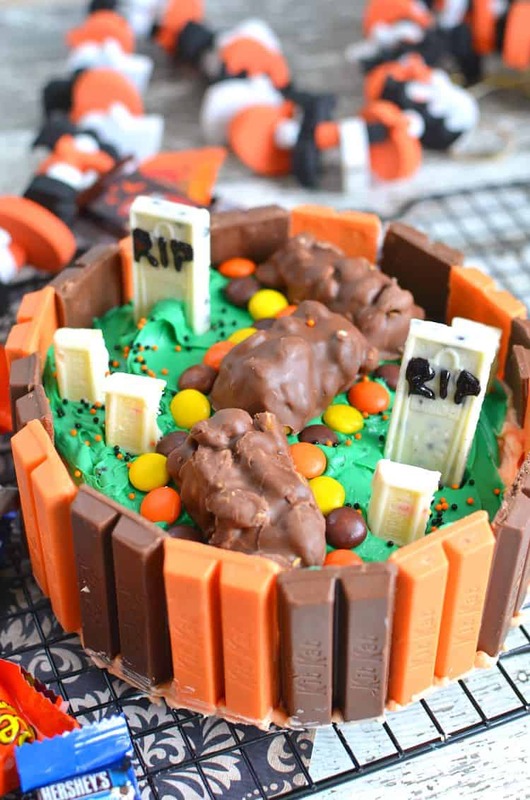 In that case, we think you might have a better time with something like this Kit Kat Halloween cake featured on Mommy Musings! 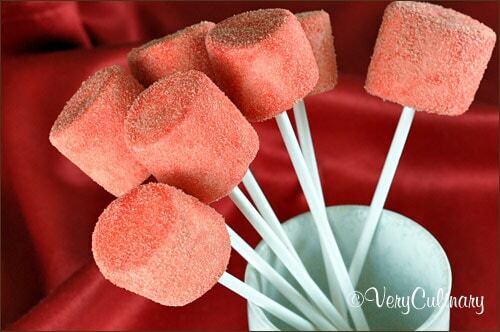 Bake and ice the cake and then let your kids use their Trick or Treat bag to decorate the top like a graveyard. 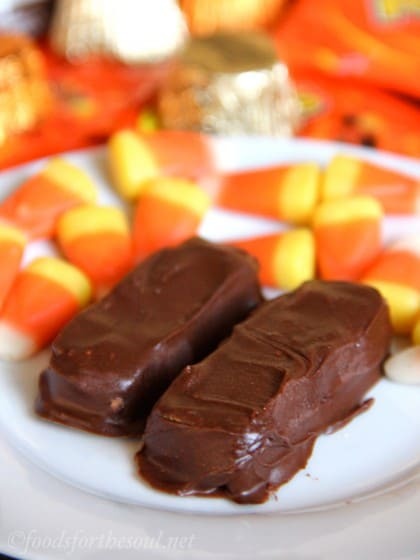 The post Cool Desserts to Make With Leftover Halloween Candy appeared first on WonderfulDIY.